Next, detractors would, ironically, say: “Everyone knows savings don’t start in the first year.” And yet the Koop Awards—the award given to the best-in-country wellness program by a group of wellness promoters that licensed the name of former Surgeon General C. Everett Koop, MD, (which had a “For Sale” sign on it later in his life)—almost invariably go to programs that show massive first-year savings by comparing active motivated participants to non-participants. 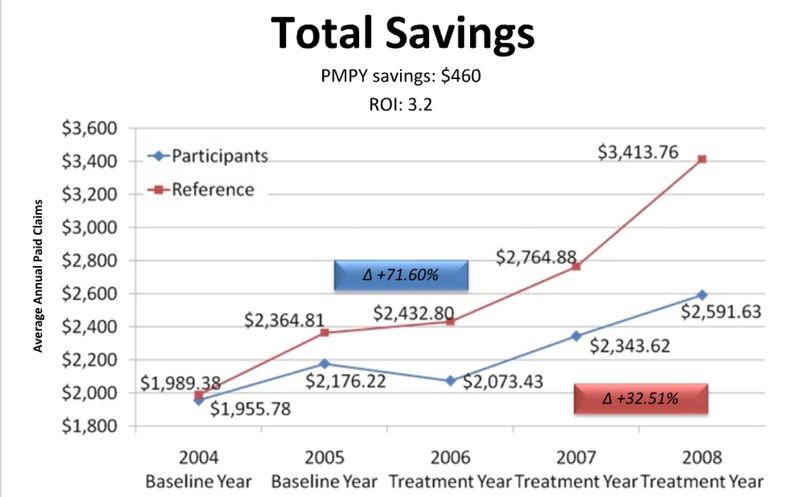 In one award-winning case, those massive savings started 2 yearsi before the program was implemented. Detractors would also say: “This study was misdesigned because they lumped nonparticipants and participants together. Obviously, nonparticipants would have no interest in this program.” That, of course, is a feature of this study design, not a bug. This study design controls for motivation, in order to isolate the program effect from the self-selection bias, such as the bias evident in that very same award-winning study. All these negative reviews took place in LinkedIn groups that are generally closed to the public, and also to wellness critics. Despite multiple requests to comment, the Health Enhancement Research Organization (HERO, the wellness industry trade association) has offered no rebuttal, response, or even acknowledgement of the existence of this study. Perhaps it fears that its comments will draw more attention to the original, not just from trade publications, but also from right-wing or left-wing media outlets, neither of which have been supportive of workplace wellness. The study could be criticized on 1 key point, a flaw that no detractor spotted. The 2 groups were compared on the basis of change in total cost, rather than (or in addition to) the change in the total number of wellness-sensitive medical events (WSMEs). The “gold standard” methodology of tallying WSMEs is described in my book, Why Nobody Believes the Numbers (chapter 2), in a seminal Health Affairs research study, and in HERO’s own outcomes measurement guidebook (chapter 2). It is required by the Validation Institute for outcomes validation for employee- and member-facing organizations by the Validation Institute. The reason to focus on WSMEs is that being screened for heart disease and diabetes, providing information on one’s diet and exercise, and having access to a gym could not be expected to reduce total costs, but rather just the cost of avoided WSMEs. Wellness programs aren’t going to get “medical costs to decrease significantly for neoplasms and digestive systems [sic], and for blood and blood-forming organs,” though a widely cited study made that exact claim. i The separation of participants (green line) and non-participants (orange line) took place in 2004. The program started in 2006. By the time the program started, participants had already “saved” almost $400, without even having a program to participate in.